The Pentagon last week gave the Obama Administration a failing grade in Afghanistan but its assessments about the war give President Obama an excuse for a quick withdrawal – his real strategy. The report to Congress blows holes in Obama's optimistic timeline of beginning a withdrawal of troops next year as it lays out the challenges blocking our exit: the enemy’s surprising resilience, the population’s deep-seated lack of support for the Afghan government and the unreadiness of the Afghan Security Forces (ASF) to secure that country. The 150-page report, “Report on Progress toward Security and Stability in Afghanistan,” is the fifth in the series and covers the period October 2009 to March 2010. The Pentagon’s report comes at the one-third marker for Obama’s strategy. Last December, the President promised to “reverse the Taliban’s momentum and increase Afghanistan’s capacity over the next 18 months (by July 2011).” Then he promised our troops would begin coming home. Ignore the Pentagon’s spin. The report is really about managing public expectations to help prepare the country for strategic failure like in Vietnam. Obama’s Afghan strategy copies President Nixon’s Vietnam exit formula: create conditions for our ally to take over the fight - “Vietnamization” - and then leave. The report states, “The insurgents [Taliban] perceive 2009 as their most successful year” and expect to sustain that effort in 2010. 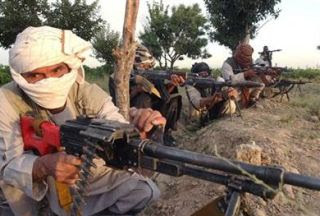 The Taliban viewed expanded violence as a “victory,” and they perceive “low-voter turnout and reports of fraud during the past presidential election as further signs of their success.” Violence was up sharply last year, an 87% increase from February 2009 to March 2010. The Taliban are growing in strength, effectiveness and they have access to sufficient weapons and ammunition. They also have a steady flow of funds from taxing the opiate trade and external help from supporters in Islamic states. And there’s no shortage of recruits drawn from a frustrated population. The Pentagon report also identifies the insurgents’ strengths. The Taliban dominate information operations, which explains the population’s skepticism about their government. Their tactics are “increasing in sophistication and strategic effect” and they have “qualitatively and geographically” expanded the battlefield. They effectively intimidate the population through targeted killings and threats or through their effective shadow governance that discredits the Afghan government. In addition, Obama’s counterinsurgency (COIN) strategy depends on winning Afghan hearts and minds but the population remains highly skeptical. His strategy focuses on 121 districts that are considered “the most critical to success.” The report admits our forces have “the resources to conduct operations (only) in 48 (40% of the) focus districts” and at this point “the population sympathizes with or supports the Afghan government in 24% (29 of 121)” of those districts. The population identifies widespread corruption as their main concern. Eighty-three percent of Afghans stated “government corruption affected their daily lives,” according to the report. Most (59%) Afghans believe the government was heading “in the right direction” but 24% believed that government was more corrupt than a year ago. Public skepticism about their government is evidenced by the ongoing campaign in Marjah, Helmand province. That battle began in February and was expected to validate Obama’s strategy. But we still don’t have the locals’ trust and the Taliban continues operations in spite of thousands of U.S. Marines and the ASF standing guard. Fielding a ready Afghan army is tough. There is a serious shortfall – up to one-third – of trainers and mentors promised by NATO allies. The report indicates the ANA can meet its growth goals but it can’t quickly produce sufficient qualified officers and non-commissioned officers for new units, a critical problem for any military. Other serious problems include rooting out corrupt and incompetent leaders, identifying Taliban infiltrators, low literacy rates and absent-without-leave personnel which rose to 12% last fall. The ANP meets its growth requirements but the report expresses concern “regarding the ability of the ANP … to improve the quality of both basic police training and the quality of the field force.” The report indicates that most (60-70%) policemen were never formally trained before being posted to their stations. ANP training is just one of many personnel challenges. Most policemen are illiterate and nearly 14% tested positive for drugs last year, mostly for hashish use. And the ANP is marred by high levels of corruption such as selling promotions or operating illegal roadblocks to collect bribes. Even if the ANP had a competent force it lacks an Afghan rule-of-law capacity. There is no functioning court system with judges, prosecutors and correctional facilities. Lacking this capacity will make the ANP “ineffective over time,” according to the report. These challenges – a thriving enemy, a government without popular support, and a fledgling ASF – demonstrate why Obama’s 18-month strategy won’t work. After all, the average successful U.S. counterinsurgency strategy since 1945 lasted 14 years, according to a 2008 Rand Corporation study. But the truth is Obama knew from the start he would follow the Nixon exit strategy by creating an “Afghanization” plan and then quickly leave, no matter the consequences. Three events will soon reveal Obama’s true strategy – an expeditious exit. First, the battle for Marjah was a proof-of-concept for Obama’s strategy but the much anticipated battle for Kandahar, expected to begin this June, is the real litmus. That city is Afghanistan’s second largest and the spiritual home of the Taliban. Success in Kandahar depends on the Taliban melting away, the population embracing a new government aligned with Kabul and the ASF controlling the city. None of these outcomes are likely in the short term which Obama’s COIN experts must anticipate. The consequence will be a loss of domestic support for the war and calls for an early exit. Second, next week President Karzai visits Washington. He is expected to ask Obama to join negotiations with the Taliban to end the war. But if Obama agrees to negotiate with the Taliban before his strategy is proven in Kandahar, then his plan will prove to be a ruse from the start. The third event is whether Pakistan attacks the Taliban’s juggler in North Waziristan, the sanctuary for most Taliban leaders. That outcome will demonstrate Obama’s perceived sincerity about winning peace in Afghanistan. But Islamabad likely knows Obama intends to abandon Afghanistan and therefore Pakistan will spare the Afghan Taliban. The Pakistanis need the Afghan Taliban’s help fending off interlockers like Iran and India once the West leaves. The Pentagon rightly gave Obama’s hurried-up Afghan strategy a failing mark. Now the President may switch from his “Afghanization” plan to his real strategy, an expeditious exit, but that won’t become evident until the three aforementioned events play out as expected – the Kandahar campaign bogs down, Obama starts peace talks with the Taliban and Pakistan refuses to attack the Afghan Taliban in North Waziristan.